Senator Edward M. Kennedy, diagnosed today with a malignant brain tumor, is sidelined at the moment his party is poised to realize the causes and ideals he has promoted for so long. The big political story today will not come from Oregon or Kentucky. It has arrived, already, from Boston. 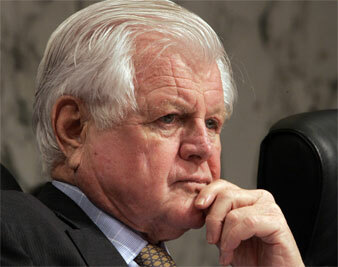 Ted Kennedy is seriously ill. The seizures he suffered over the weekend were related to a malignant brain tumor that, depending on its seriousness, could end his tenure in the Senate. How successful that treatment will be depends on how advanced his condition has become. Kennedy is reportedly “in good spirits and full of energy.” And it is probably fair to say that if anyone can beat a tumor, it is this epic persona. But Kennedy, who has been a critical player in defining liberal Democratic politics for better part of fifty years, is likely to be sidelined at what will be an essential moment for the causes and ideals he has promoted for so very long. Democrats are on the march, poised to gain control of both the White House and the Congress for the first time since 1994–and, perhaps, for the first extended period since Kennedy came to Congress in the 1960s. His candidate for President, Barack Obama, is about to secure the Democratic nomination. Voters in Oregon are expected to give the Illinois senator a solid win tonight, while voters in Kentucky back New York Senator Hillary Clinton. When all is said and done, Obama will move to within touching distance of the nomination. That nomination, which will come by acclamation, will be made at this summer’s convention in Denver. Since 1972, Kennedy has delivered the loudest, the boldest and often the most moving addresses at the quadrennial gatherings of what is in so many senses his party. The question, today, is whether the liberal lion can roar once more at a Democratic National Convention. The hope, surely, is that he will.